This St. Patrick’s Day, all of us here at the Sausage Maker ask you to keep one thing in mind: You don’t have to be Irish to enjoy some delicious homemade corned beef! This old-time favorite is quite easy to make at home with just a couple of convenient ingredients. Follow our recipe below for a traditional treat that'll have the whole crowd's mouths watering. Note: You can also make a delicious pastrami with this method; you’ll just smoke the meat instead of boiling it. 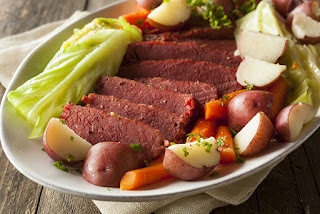 The classic choice for corned beef is, of course, beef! To be more specific, most traditional cooks use beef brisket. But if you’re feeling a little adventurous this year, there are plenty of other meat choices too! The Sausage Maker’s founder, Rytek Kutas, spent years testing all sorts of cuts and kinds of meats to take the guesswork out and leave you more time to chow down. A few favorites of his for corning include venison, elk or moose shoulder roasts and, believe it or not, turkey thighs come out fantastic. All four choices are leaner options too, which means you can eat even more. Start by mixing all the brine ingredients together thoroughly. 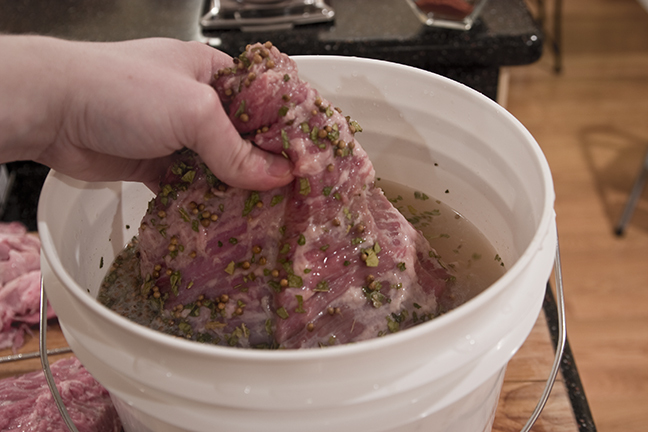 Place the meat in the brine, making sure it is fully submerged. Store under refrigeration for three days for roasts under 3” thick, and add an additional 24 hours of curing time for each inch of roast after that. InstaCure is already included in our Sausage Maker corned beef cure, which means the meat will take on a fantastic pinkish tint as it cooks. Speaking of cooking, we should clarify just how long to boil it. The answer? A while. Remember, these are roasts we’re talking about! An hour per pound is the general rule of thumb. Slice meat razor thin and against the grain. Using a deli slicer makes things look even more top-notch. Turkey thighs will be faster to cook, right around an hour of boiling time. Serve on the bone or carve up as you see fit. For those interested in making pastrami, you'll cure the meat the same way but soak the roast under refrigeration overnight to draw out a little excess salt. Pat the roast dry using clean paper towels. Rub down the roast with spices or a rub as you see fit. 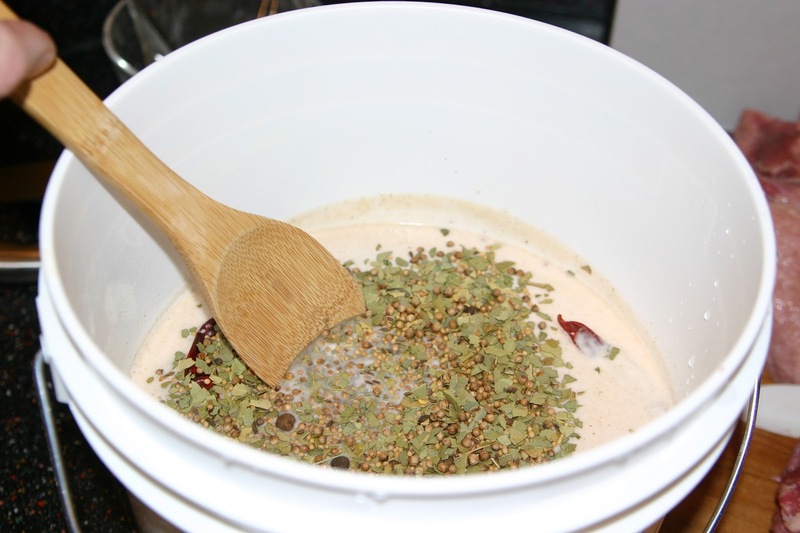 Coarse black pepper and ground mustard are excellent spice choices. Place an aluminum pan filled with 1-2” water on a shelf directly under the meat to catch drippings and keep things more humid in the smoker. Smoke at 180-200°F with the chimney at least half open, using dampened hickory or apple wood for approximately four hours or until the internal temperature reaches 145°F for beef (165°F for poultry or game meat). Wrap the roast in foil to keep juices from dripping out and the surface from drying. Now it’s time for steam. Swap the wood chips for water in your sawdust pan and bring the temperature up to 200°F to turn the smoker into a sauna. Cook another 2 or 3 hours or until the internal temperature hits 180°F (or close). The roast was done safe at 145°F; it’s all about tenderness at this point. That’s it! Slice thin against the grain, just as you would for corned beef. Enjoy it, savor it, you did it yourself!